What fun to be part of a magical family! Magical Matthew is called home from college and questions Magical Mea, who is now in middle school, about the mysterious family meeting. They don’t have long to wait. 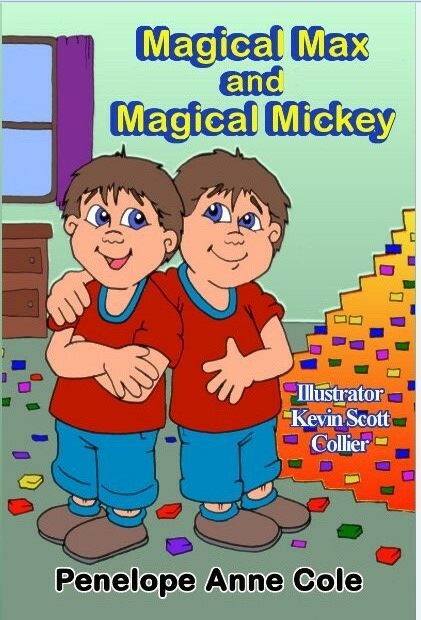 In MAGICAL MAX AND MAGICAL MICKEY, Penelope Anne Cole’s chapter book for grades 1-3, Matthew and Mea’s family will soon be enlarged by two: twin boys that is. The older children, whose magic went away after they lost their last baby teeth, Grandma Nonie, and neighbor Lily are wondering if these two babies will also be magical. If so, they won’t mention it to Mom and Dad, just as they never mentioned Mea’s and Matt’s special talents. Sure enough, when the boys are three years old, their magical abilities start to show up. They quickly build a lounge chair with plastic blocks so Grandma Nonie has a place to land when she falls. It looks as if they are going to be as helpful as Matt and Mea are in the other books in this Magical series. But I’m not going to reveal all the secrets in this clever book, illustrated in a realistic way by award winning artist Kevin Scott Collier. I enjoyed seeing Matthew and Mea growing up; it’s like watching neighbor children. I think this is probably unique in a series, and a good idea to keep the readers interested and coming back. plus Mateo Mágico (Spanish) and Ten Little Tricksters. Also, Magical Mea Goes to School. Ms. Cole has used her books to show the story arc in response to literature lessons (main character has a problem or obstacle). How does MC solve problem, get around obstacle in the climax, then what does MC learn, how do they grow, and then their response to the surprise ending. Attention teachers: Ms Cole does Free Skype Author Visits. Folks can contact her to order a signed copy using the contact form on her blog or through her website. Or they can order ebooks and print copies on Amazon. Night Wolf Publications brought out its first holiday anthology, A Yuletide Wish: Poems and Stories for the Extended Holiday Season, with beautiful cover art by Aluska Bissaro. My story, “Baby in the Manger,” is there on pages 8-11. The book is available at this time through Amazon.com and will be available later on the NWP website in electronic form. The editors are Jamieson Wolf and Sandy Lender, people I met through the Muse Conference. The stories and poems in the book are intended for the whole family, from little kids on up. Of course, my story is for children of all ages. Title: Hook the Reader: Muse Forum with Earl Staggs: This is one of the workshops I participated in last week. Well, the 2010 Muse Online Writers’ Conference has come to a close. It’s something we Musers think about and plan for all year. The Presenters are professional in their manner and share their expertise generously. The Attendees are serious in their desire to improve their craft and take criticism with gratitude and grace. The knowledge we take away is concrete, specific, and usable. And the most wonderful thing (besides the Muse, Lea), is that we meet fellow writers and sometimes make life-long friends. The setting for the story is the northern part of Florida, not too far from the beach. The time period runs from early fall until the following spring, with the era being contemporary. The wounds referred to in the title involve an act of vandalism by the boy, Craig, against a huge old oak tree belonging to his neighbors. Craig is carrying a lot on his shoulders. Not only is he grieving his mother’s death, his father started drinking too much and has become physically abusive. Craig has had all he can take. While running away, he attempts to cut down the tree and he himself is wounded. Now the question arises as to whether Craig can “mend” the tree as well as his own bad behavior. The dachshund, Siegfried, adds a touch of levity. I’m happy to announce that Lea Schizas, editor and publisher of MuseItUp Publishing, has accepted my middle grade novel, WOUNDS, for publication. I don’t have the particulars yet, but I will keep you informed as to the publication date. As you can imagine, I am very excited.